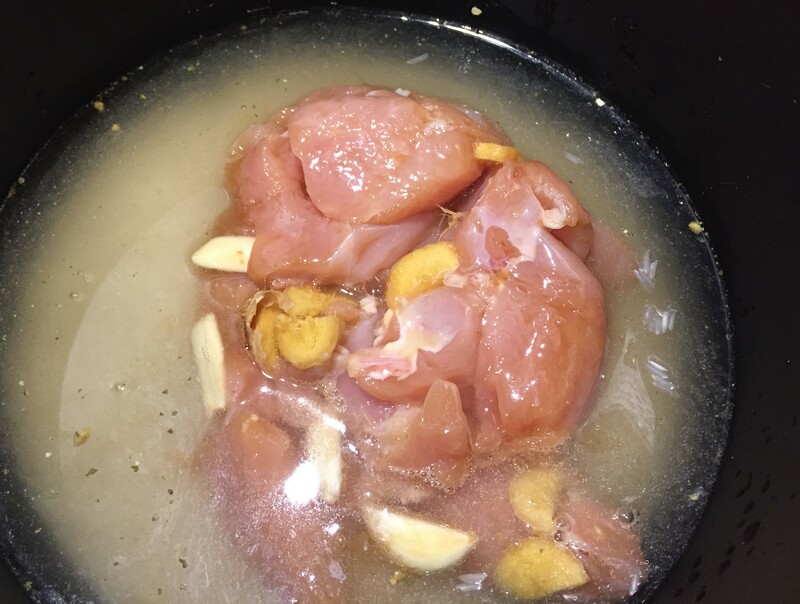 So, for our family of four I use two large chicken breasts, sliced up and marinated (for anything from half an hour to overnight depending how long you have) with a couple of cloves of garlic and a thumb sized piece of ginger, both roughly chopped, and a splash each of soy sauce and Chinese rice wine. When we’re ready to eat, I put three cups (the sort that come with the rice cooker) of rice in the cooker with the amount of water the machine asks for. I use chicken stock as part of the liquid if I have any, and if not I add one teaspoon of stock powder. 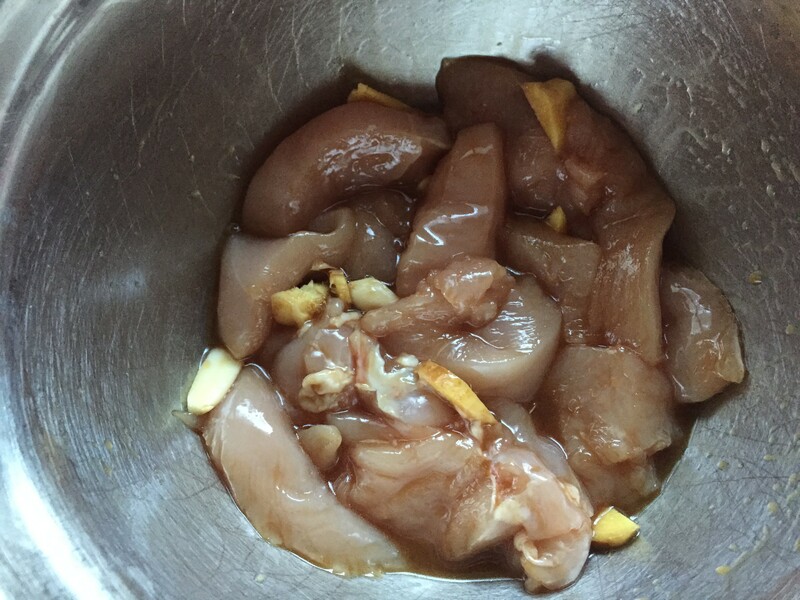 The marinated chicken is added on top along with the rest of the marinade, and then I turn the machine on. 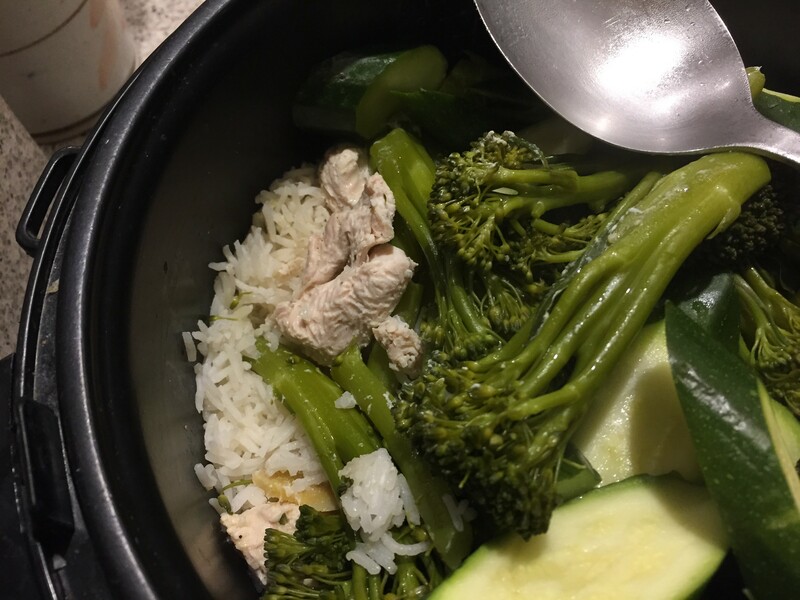 Near the end of the cycle, I add chopped quick cooking greens such as broccolini, bok choy, gai laan etc. If it’s a really hectic evening we just eat with extra soy, but it’s quite easy while the rice and chicken are cooking to make a wonderful sauce by heating a few tablespoons of peanut oil until it just starts smoking, and then pouring it over finely sliced extra ginger and spring onions. Add salt to taste and drizzle over your chicken, rice and greens. So what do you think about recipes that provide detailed information compared to those that just give an outline? And do you like making your own variations, or do you want to make something exactly like the original recipe? I use recipes for inspiration. I never follow them completely as I like to cook to taste and intuition. Never cooked raw chicken in our rice cooker though I have steamed fish and vegetables. To be honest, I wasn’t sure that chicken would cook all the way through. Inspiring Beck. I love recipes like this and I am sending the link off to my son pronto. I like ideas recipes too 🙂 But I’ve never used a rice-cooker, especially for the whole meal, and I’m wondering how you know how long to give it and about how long it takes for everything to cook through. This sounds yummy and delightfully simple! I love this Beck. So easy. My type of cooking. Great ideas, just all in the rice cooker. I rarely follow recipes, exceptif I am trying something new for the first time. Those regular favourites are often the best meals. Yes, this is a quick and easy and delicious sounding meal. I think the rice cooker is a fabulous implement for doing an all in one type of dish. 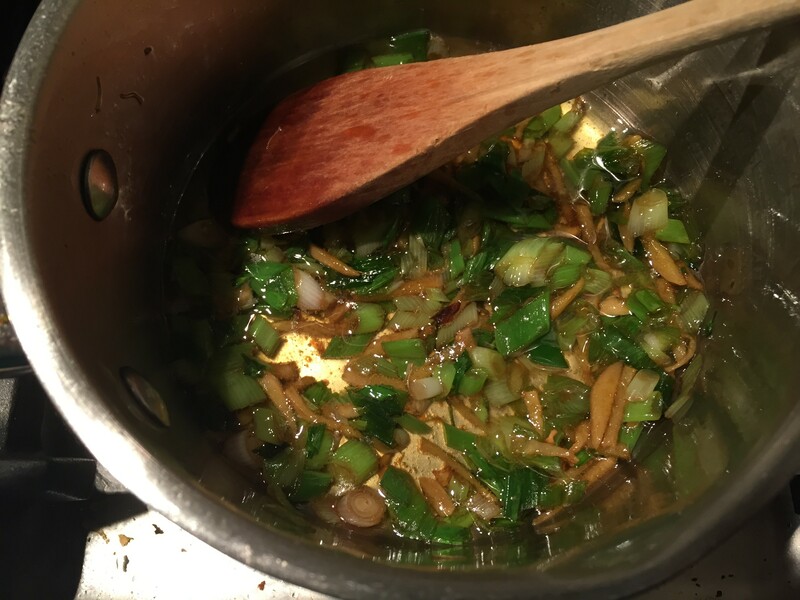 By using stock instead of water to cook the rice and then adding in the marinade and ginger oil on top of the other ingredients, you’re getting super flavours intermingling. And with a non-stick rice bowl, the washing up is almost non-existent. I made this! I increased the amounts for our larger family – worked a treat. Will be doing it again, so easy.